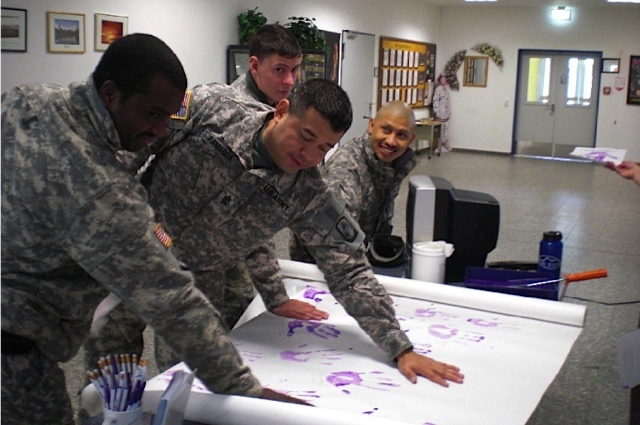 U.S. Army servicemen taking the pledge in October for Domestic Violence Awareness month. 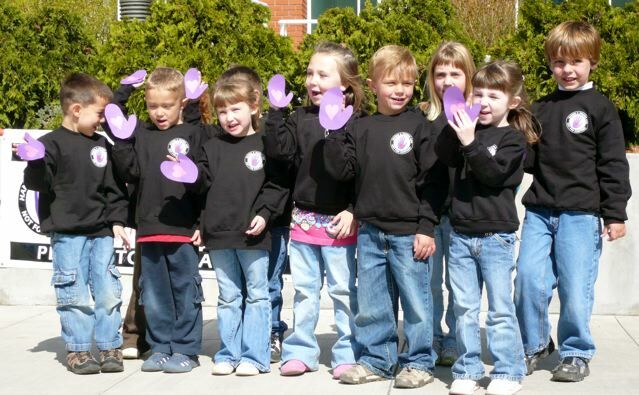 Peer Mentors and their counselors, Salem, Oregon, present at 2008 Cesar Chavez Leadership Conference at University of Western Oregon for third year in a row! 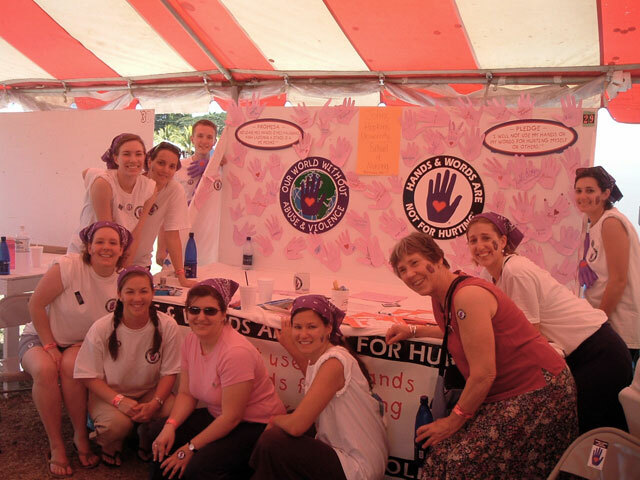 Nursing Students love taking the Pledge from Baltimore, MD to schools and communities in the Virgin Islands 2006-2008! 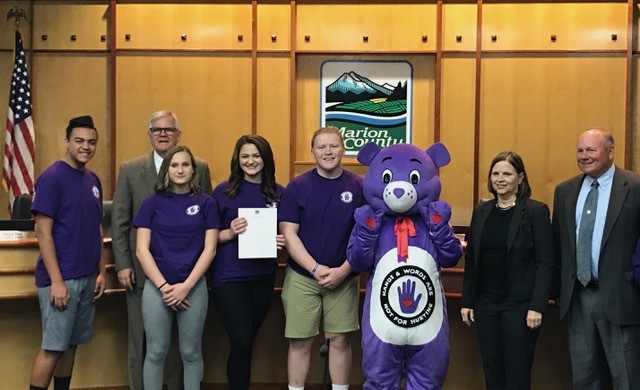 Student activists under the guidance of Mr. Jim Taylor, Director of Choirs, created an elective "Hands and Words Are Not For Hurting Project Class" promoting widespread participation in the Purple Hands Pledge to end abuse and violence in their homes, school, community and internationally. 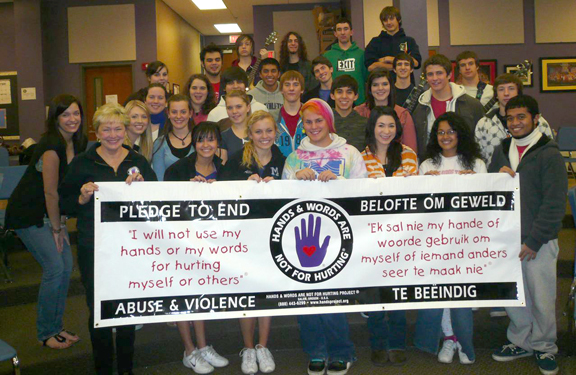 Families Against Violence Program reaches over 7,000 students in Northwest Province of South Africa! 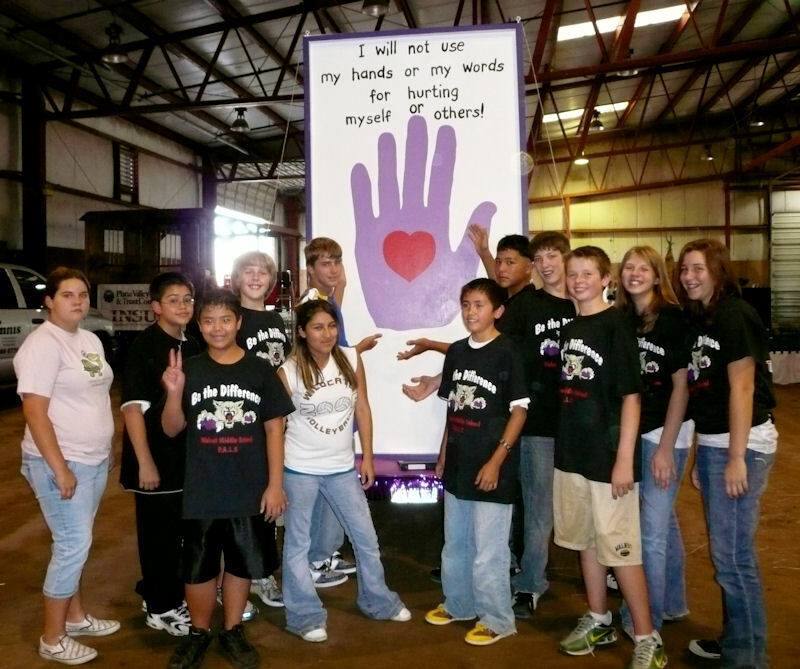 Walnut Middle School prepare float for "Harvest of Harmony Parade" embracing the Pledge in their community! 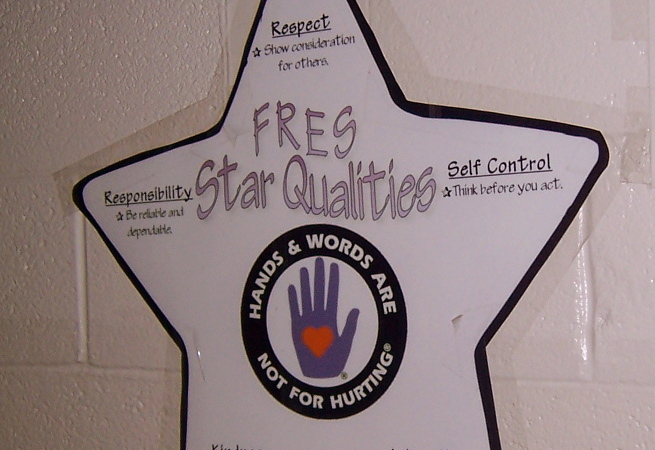 French Road Elementary, Rochester, NY French Road Elementary in Rochester, NY is a "shining star" model partner! National Blue Ribbon Award recipient from US Department of Education. Congratulations! 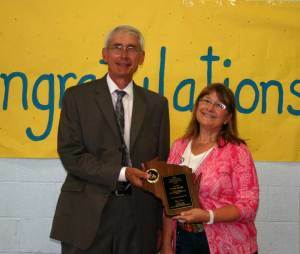 State superintendent presents award to Linda Bergh. Eagle Point, WI. 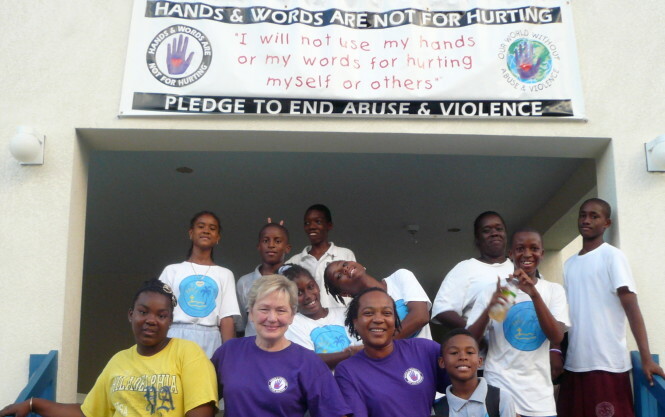 End Abuse and Violence in our homes, schools, and communities around the world. Mission Statement: To educate each person in every community about their moral and legal right to live free of abuse and violence. 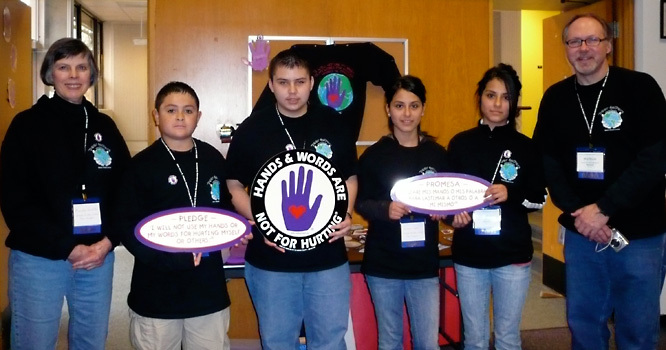 The Hands & Words Are Not For Hurting Project ® is an effective tool and a key piece in the puzzle of abuse and violence prevention education.